Throughout the season these 3 Home Teams will be battling it out to be named the 2018 Champion. Who do you think will skate away with the title?? Don’t let the pink and purple fool you. These refined ladies can be tough, too. Opponents can’t help but be entranced by their sweet talk, rosy cheeks, batting eyelashes and sparkly crowns…but as soon as they look away the Duval Derby Dames are ready to attack. They’ll knock you to the ground and then blow a kiss as they cheerfully skate away. Like a secret stealth mission, the First Coast Fatales are always lurking in the distance. Like snipers, they take out their targets before they even know what happened. Once they sink their fangs in…it’s over. 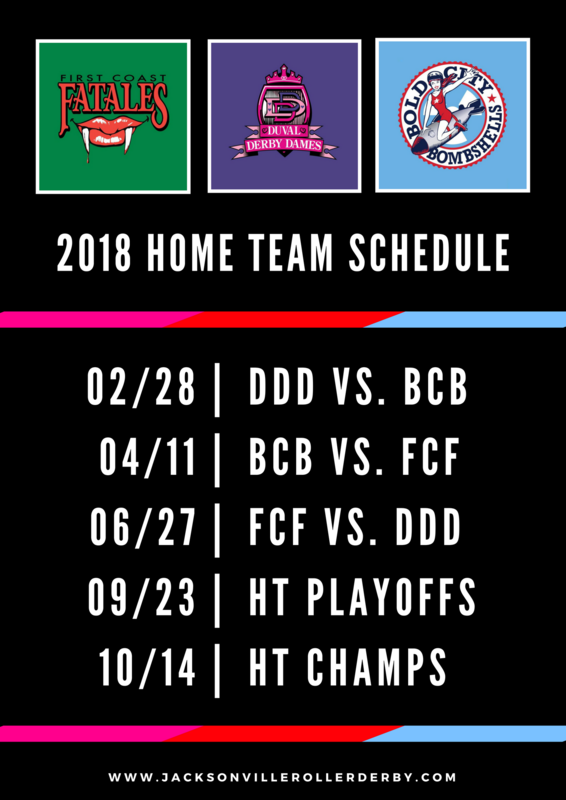 2018 Champions: Find out on 10/14/2018!! !